It is no fun being a baby. In those first couple years of life, think of all the things they have to do. Learn to sit, walk, talk, and learn to eat all while their teeth are coming in. It’s no fun being a baby. With my 18 month old in the thick of teething, I’ve come to find some easy tips and tricks that calm her fiery gums when those teeth are giving her grief. Our pediatrician recommended we stick to old fashioned tricks to help her ease the pain. With canine and the last of our molars coming in, here are a few of the tools I’ve been pulling out of my Mom Tool Box. 1) Teethers – For instant cold relief, a frozen teether is a wonderful option for your teething tot. I keep 4 frozen at all times and alternate. Sometimes, it is easiest for your tot to focus on chewing and watch their favorite cartoon. It takes their mind off the pain and the cold calms quickly. We also have a few non frozen animal chew options available. We will take one in the car when a cold option is not readily available. 2) Infants’ Advil® – when teethers aren’t working, we move into option 2 – medicine. Watching your child in pain is never anything a parent likes to see. Knowing that I have Infants’ Advil® on hand, I can easily give her some relief in addition to the other tricks we try. I also like that I can quickly run to my local Walgreens and pick up Infants’ Advil® for my daughter. It is located in the children’s medicine aisle with the other infant options. We always try to have 2 bottles on hand just to be on the safe side. You never want to run out in case you need it in the middle of the night! Infants’ Advil® contains ibuprofen, the medicine pediatricians use most for their own kids’ fevers. It also offers parents a simple, effective solution to relieve their babies’ pain with up to 8- hours of relief in just one dose. 2) Popsicles – The perfect teething snack. We keep a variety of Popsicles on hand and I even make homemade yogurt Popsicles as an option as well. The cold cools the gums and provides the much needed relief. Miss H loves strawberry yogurt pops – a great cool relief! If you don’t have time to make Pops, toss a few yogurt tubes in the freezer, they work just as well. 4) Frozen Wash Cloths – When it comes to teething, cold is the best. Keeping a few wet frozen wash cloths in the freezer at all times are an easy way to grab and go. Just fold in quarters, and get the cloth wet and then put in a reusable freezer bag and grab when you need them. I always have two or three on hand. These teething tricks have certainly worked for us. 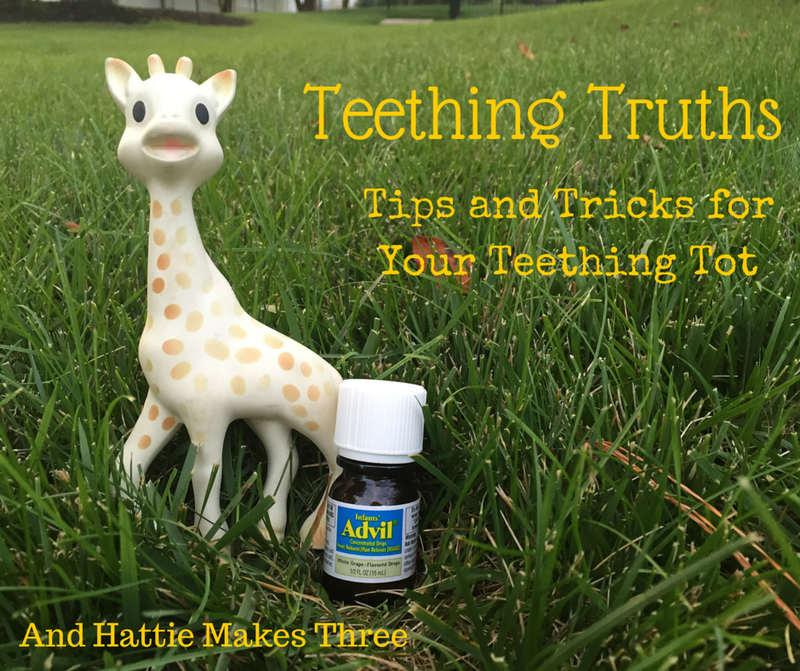 Ready to try Infants’ Advil for your teething tike? Check out this coupon to save $1.50 before you head to the store!